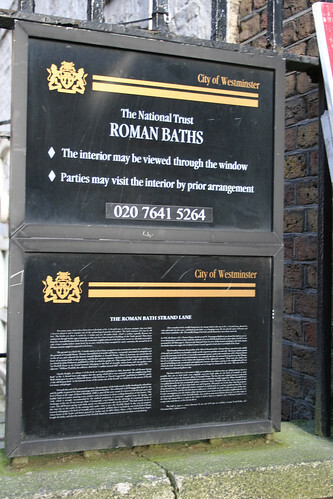 Hidden away in central London is a historic bath house – originally credited as being built by Romans, although that is frankly, a rather dubious heritage. Anyhow, some years ago, I visited this spot when with a group of friends – although I can’t recall how we found it as it is not the sort of place you can just wander past. Unfortunately, while I remembered the venue, I couldn’t remember where it was. Last week I was using Google to try and find a totally different location, and this one actually turned up in my searches so today I wandered back to have another look. 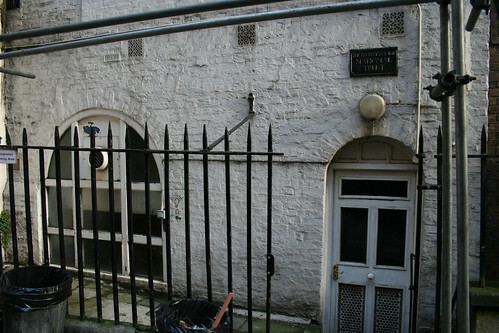 Exterior of the "bath house"
There has been a bath on the site of 5 Strand Lane since at least the 18th century, and although it has been attributed to the Romans, the construction is not typical of the Roman style. The bath is also unusually shallow in the ground, while Roman ruins tend to be deeper in the earth. According to a sign explaining the history of the baths, there has been a building on the site since at least the 17th Century – within the grounds of Arundel House. Thomas, Second Earl of Arundel and Surrey was a known collector of antiquities, but there is no record that he was aware of an ancient bath-house within his property. The earliest written reference that is known is from a book published in 1784 which makes reference to a “fine antique bath” in the cellar of the house. A second reference in a book published in 1842 makes reference to an “old Roman Spring Bath” at 5 Strand Lane and suggests that it was fed by the local spring in Holywell Street. The bath and spring were also mentioned by Dickens in David Copperfield. 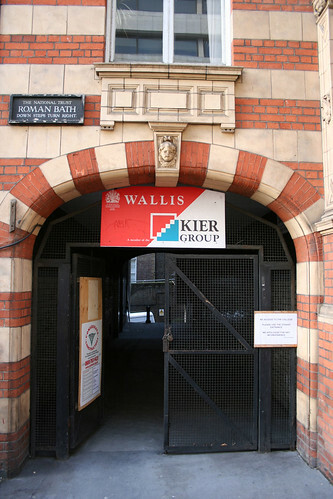 Towards the end of the 19th Century, a local owner heavily promoted the baths as a healthy spring with a fast change of water so that bathers would not be immersed the dirty water from previous occupants. Indeed, the spring in the area still pumps out some 2,000 gallons of water per day, although any health properties are unknown. In 1922, the Rector of St. Celement Danes, the Rv. W Pennington Bickford purchased the baths to preserve them from demolition and put them on show until the outbreak of war in 1939. In 1947 it was donated to the National Trust, and even though its heritage is uncertain the London County Council agreed to maintain it on behalf of the Trust. 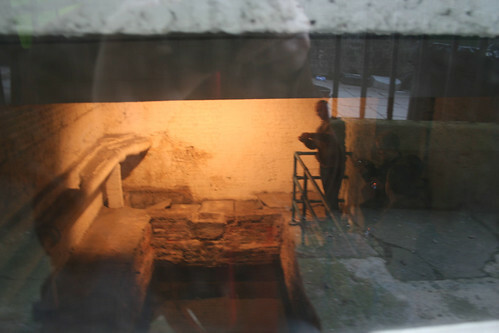 The current thinking is that the baths may have originally been a water reservoir for the use of staff working in Arundel House, and this is supported by the fact that it was accessed from the back of the building where the servants would enter, as opposed to the front where a proper public bath would have been accessed. When the early Arundel House was pulled down, the land could have been built over the rubble and the reservoir lost until its re-descovery about a hundred years later. At the moment, you can peer through a window in the wall to see the “baths” and a small light can be flicked on to illuminate the interior. It is possible to go inside if you are with a group and arrange it with Westminster Council. While there isn’t really a lot to see there, it is still a nice mini-detour if you happen to be in the area and you can tell people about this incredibly well hidden bit of London’s history. In an odd sort of way, the discovery is more exciting than the end location. To get to the venue, head to Surrey Street which is near to Temple tube station and presuming that you are heading away from the river, you will see a small entrance on your left. Head into the alley and then down a flight of stairs and turn right. Then you will easily see the baths. If the alley is closed, head down towards the river and turn right and Strand Lane may be accessible from there as well – although I noticed that end also had (open) gates which may be closed at times. Strand Lane used to be a well used narrow lane that lead down from The Strand itself towards the river, but the expansion of Kings College has severed the head of the road so that the only easy access is via the alley from Surry Street. Another slight bit of history about the lane is that it used to lead down to a pier in the river – which may have been called Strand Bridge. There is some confusion about this, as some records suggest that there was an actual bridge which ran over the lane – as the lane was originally a water stream and the roads crossing the stream (later Strand Lane) would need a bridge. This is uncertain though. I tend to support the view that the “bridge” was actually a riverside pier though, as there is a criminal record in the Old Bailey which reports a theft from a cargo ship in June 1815 which was moored off Strand Lane. 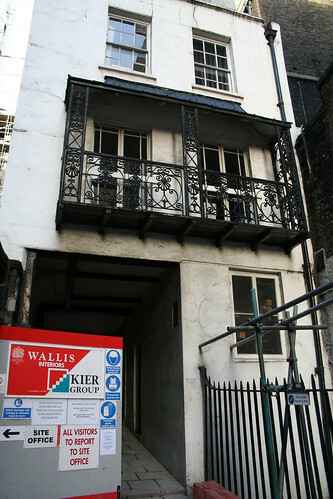 There were also some other notable crimes recorded as being prosecuted at the Old Bailey which occurred on Strand Lane. The earliest recorded crime occurred in 1681, when a lady picked the pocket of a French Gentleman, but due to the delay in reporting the crime she was acquitted. From the description, I guess that that lady may have been “of the night”, and the lane a haunt of prostitutes! A John Stevens was convicted of stealing a silver tankard in 1739 from a house on the lane, worth Â£6 – a vast amount at the time. Alas for him, he was caught, convicted and sentenced to death. In 1830, a 21 year old delivery boy, James Jackson stole a coat from a store on the corner of Strand Lane. He was convicted and sentenced to “Transported for Seven Years”, which means he was sent to Australia. There is a record in the Australian Convict Index showing that a 24 year old called James Jackson was sent to the colony in 1835, which fits the details above. He was sent to New South Wales on the ship, the Lady Nugent. A slightly more gruesome issue also exists in the street – and that is the deceptively nice looking building which straddles the road. The road itself was the boundary between two church parishes, and the building itself belonged to St Clement Danes and was a “Watch House”. Before the Anatomy Act of 1832, medical students were limited to using the dead bodies of executed murderers to study on – so there was a criminal trade in stolen dead bodies which were sold to hospitals for study. As a result of this, many churches built Watch Houses as a way of protecting the dead from the activities of body snatchers. It is perhaps ironic that many developments in medical surgery came as a result of the criminal activities of the body snatchers. Below are some photos I took this morning (more available at Flickr). There were builders working in the area, hence the scaffolding and mess, but the baths themselves are still accessible. Very interesting. Visited last Friday to show a friend but no lights on hitting the switch! Can’t see a thing. Tried phone no. on plaque but no joy after 4 depts. at Westminster Council who knew nil re this bath! What do I do to get lights going again? Any ideas? I believe the Watchhouse was also for monitoring flooding from the Thames. If you look closely at the external wall of the Roman Bath when visiting it will be seen that there are foot measurement markings up the wall. There is a river culvert under the lane. There is a covenant for Norfolk House – used to be the Norfolk Hotel) – in which the Bath is contained stating that the water supply from the river to the Bath is not to be disturbed. If you go to the bottom of the Lane and look up at the King’s College MacAdam building you will see a small badge with Dutchy Of Lancaster on it. It would have to be a famously devastating flood to reach as high as the building. The Thames at the time would have been at least two metres lower than the building. 4 Pings/Trackbacks for "Of Roman Baths, Body Snatchers and Australian Convicts"